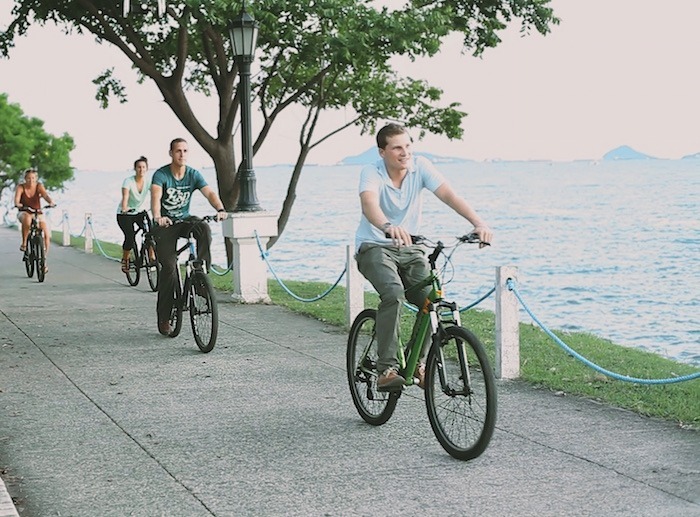 Located at the mouth of the Panama Canal, the Amador causeway is a 4km palm-tree lined avenue and biking / running path that links the canal zone neighborhood of Balboa to Flamenco and Perico Island. Jutting out into the bay of Panama, the Amadaor Causeway has some of the most amazing views of the Panama City skyline, and the Pacific entrance of The Panama Canal. The Amador Causeway is also home the future Frank Gerry designed Biodiversity (opening 2012), restaurants, bars, duty-free shopping, and Balboa and Flamenco Yacht Club. It is a short 5 minute taxi ride from Casco Antiguo Spanish School. Running or biking here at sunset is an unforgettable experience. Students who sign up for our Small-Group Intensive Course receive a free 1-hr Bike Rental!